General Appearance: Small, dainty, compact. 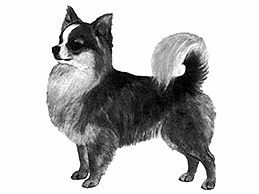 Characteristics: Alert, little dog, swift moving with brisk forceful action and saucy expression. Temperament: Gay, spirited and intelligent, neither snappy nor withdrawn. Head And Skull: Well rounded 'Apple Dome' skull, cheeks and jaws lean, muzzle moderately short, slightly pointed. Definite stop. Eyes: Large, round, but not protruding; set well apart; centre of eye is on a plane with lowest point of ear and base of stop; dark or ruby. Light eyes in light colours permissible. Ears: Large, flaring, set on at an angle of approximately 45 degrees; giving breadth between ears. Tipped or broken down highly undesirable. Mouth: Jaws strong, with a perfect, regular and complete scissor bite, i.e. the upper teeth closely overlapping the lower teeth and set square to the jaws. Neck: Slightly arched, medium length. Forequarters: Shoulders well laid; lean, sloping into slightly broadening support above straight forelegs, set well under chest giving freedom of movement without looseness. Body: Level back. Body, from point of shoulder to rear point of croup, slightly longer than height at withers. Well sprung ribs, deep brisket. Hindquarters: Muscular: hocks well let down, with good turn of stifle, well apart, turning neither in nor out. Feet: Small and dainty, turning neither in nor out; toes well divided but not spread, pads cushioned, fine, strong, flexible pasterns. Neither hare nor cat-like, nails moderately short. Tail: Medium length, set high, carried up and over back (sickle tail). When moving never tucked under or curled below the topline. Furry, flattish in appearance, broadening slightly in centre and tapering to point. Gait/Movement: Brisk, forceful action, neither high stepping nor hackney; good reach without slackness in forequarters, good drive in hindquarters. Viewed from front and behind legs should move neither too close nor too wide, with no turning in or out of feet or pasterns. Topline should remain firm and level when moving. Coat: Long, soft texture (never coarse or harsh to touch) either flat or slightly wavy. Never tight and curly. Feathering on ears, feet and legs, pants on hind quarters, large ruff on neck desirable. Tail long and full as a plume. Colour: Any colour or mixture of colours but never Merle (dapple). Sizes: Weight: up to 2.7 kg (6 lbs), with 1.8-2.7 kgs (4-6 lbs) preferred. Notes: Male animals should have two apparently normal testicles fully descended into the scrotum.